Have you been to the Mahen Theatre, the magnificent 19th century building that dominates Malinovského náměstí? Built in the neo-renaissance, neo-classical and neo-baroque styles (yes, really, all three), it is one of Brno’s most important architectural monuments. 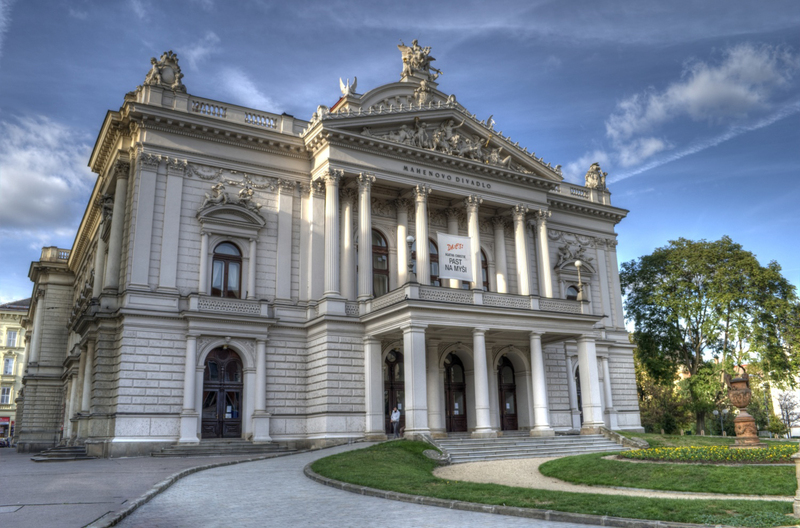 And because it is now the home of Czech National Theatre, you don’t have to go to Prague or Vienna to experience a proper 19th century opera box — you can do it right here, in Brno! Built in 1881–2 the theatre was one of the first in the world to be fitted with electric lighting. The city council had planned to have gas lighting, despite a history of devastating theatre fires around the world as a result of using gas. It was only after almost 200 people died in a theatre fire in Nice in March 1881 that the Council decided to contract the Edison Electric Light Company to install electrical lighting and to build a power station solely to supply power to the theatre. For the comfort of theatregoers, it was thoughtfully constructed 300m away to minimize the noise! You might have admired the cluster of light bulbs across the road from the theatre. This sculpture honours the contribution of Thomas Edison who designed the theatre’s wiring himself. Remnants of the original wiring are now displayed in the theatre foyer. While Edison designed the plans, he only sent an assistant to oversee the construction and did not actually visit Brno to see the installation until 25 years later. It was not always called the Mahen Theatre. Originally it was the German City Theatre. In 1918 it was renamed the Theatre on the Wall because it was built in open space created when the city walls were demolished. Jiří Mahen, the Czech playwright, poet and novelist, was its first dramaturg. The name was changed back to the German City Theatre during WWII. After the war it was renamed the Janáček Opera, then the Janáček Theatre, until 1965 when it was finally named the Mahen Theatre after the modern Janáček Theatre was opened in 1965. Interestingly, as well as being a noted contributor to Brno’s cultural life during the First Republic, Mahen was a communist who committed suicide in 1939 when the Nazis invaded Czechoslovakia. Now is your ideal opportunity to spend time in this gorgeous theatre. In January and February, the National Theatre Brno presents Black and White, a contemporary re-telling of the story of Swan Lake by choreographer Mário Radačovský who has been the Artistic Director of the Ballet, National Theatre Brno, since 2013. Set to the original Tchaikovsky score, the work premiered to wide acclaim in 2012 in the US and in Brno in 2015. We all know the story of Swan Lake: Odette, a princess turned into a swan by an evil sorcerer’s curse; Prince Siegfried, who falls in love with her; and Odile who so closely resembles Odette that her father, the evil sorcerer a.k.a. Von Rothbart, tricks Prince Siegfried into proposing marriage. There are various endings: the Prince defeats Von Rothbart and the lovers live happily ever after; they both jump into the lake and drown (definitely an operatic ending); they both live but are kept separated forever. Black and White is different, focusing on Prince Siegfried at a moment when a cancer diagnosis turns his life upside down. It is about the Prince’s journey, in the real world as well as in his imagination. He seeks refuge in romantic relationships with two very different women, only to be tormented by feelings of guilt and betrayal with the fiendish Von Rothbart as his alter ego, as put in a DanceTabs review. Just like the hero of the original story, Siegfried faces a choice — black or white. A classical production of Swan Lake is on at the same time at the comfortable but unremarkable Janáček Theatre. Why not see it and then go to see Radačovský’s version — and the Mahen Theatre in all its glory. That’s what I will be doing! Did you know that right in the heart of Brno can be found a multicultural world of artists? Meet the ballet gang of National Theatre Brno where foreigners form 65 % of the ensemble.